Not Out of the Woods, but…..
Chris checked in on the Flannery-Velvet chick today. 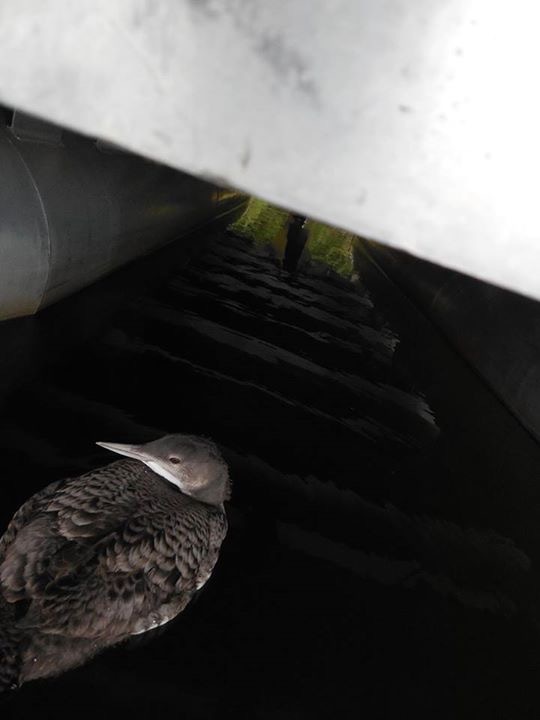 The chick, whom lake residents call “Houdini” because of his ability to escape certain death, continues to inhabit this odd world where it is necessary to hide under piers and avoid adults — rather than fraternize with two parents who feed him to satiation. When his mom is not bonding with a new male up on Flannery so that she can prepare herself for future breeding attempts, she spends time with him down on Velvet. Today Houdini begged from his mom repeatedly, but he also foraged for himself during a considerable period. The photo above, generously supplied by Hugh Jones who lives on Velvet, is notable for two features. First, it shows a chick that is in full adult-like feather. That is, it has outgrown its chicklike, downy plumage and assumed adult attire. This fact, of course, is comforting, as it shows that the chick is getting the nutrients it requires to mature and prep itself for independence and migration to the wintering ground. Second, however, the chick continues its retiring ways. It has learned to avoid adults, because of the occasional beatings it had received from its stepdad. So it seeks protection, using whatever piers and pontoon boats will give it cover. We have never witnessed a situation like this one. In all other cases, chicks that lost their fathers were either: 1) several weeks old and recipients of abundant feedings from their mothers, or 2) summarily ignored by their stepfathers and permitted to grow and mature without interference. Since we are in uncharted waters, we can only be cautiously optimistic. All we can say is that Houdini — whom LP personnel know attactionately as “white over white, pink over silver”, from his leg bands — continues to pass developmental milestones despite daunting obstacles. We are riveted on the happenings on Flannery/Velvet Lakes. On these two lakes –united through a narrow channel so as to be a single waterbody — a tense scene is playing out with elements of a Shakespearean tragedy. A 13 year-old male, hatched on Townline Lake and a frequent intruder into various lakes in and just west of Rhinelander, is opportunistically seeking to replace the deceased Flannery male. If he succeeds, he would shift from a territory on the Wisconsin River, where he has failed to fledge chicks despite three years’ of nesting attempts, and settle on a new lake that just this year produced chicks, breaking its own eight-year skein of nesting futility. In other words, this would be a step up for the male. 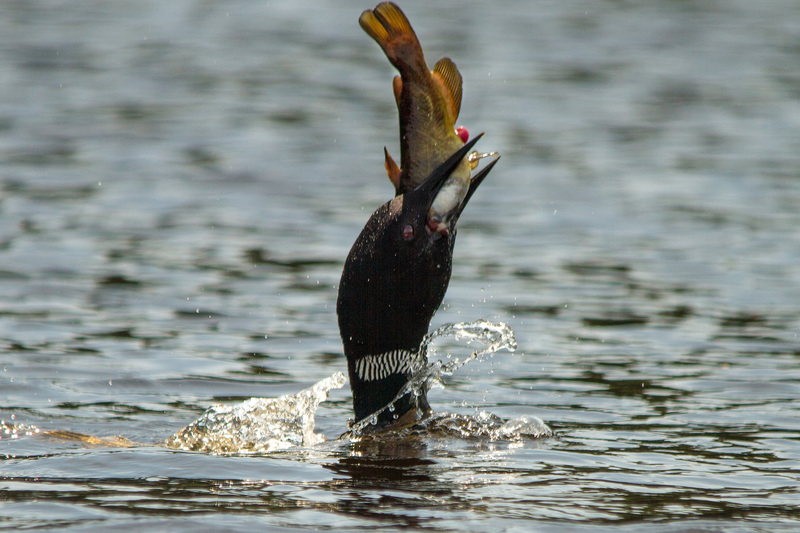 This male’s effort to relocate to a more productive breeding site has taken a dark turn. While visiting Flannery and bonding with the widowed female there, the male encountered her young chicks. One of those chicks the male killed weeks ago by pecking it to death when it was quite small. The surviving chick too has suffered repeated beatings by the male to the point where the chick now spends much of the day hiding underneath piers on Velvet Lake to avoid the abuse. This grisly spectacle has had severe consequences, as the chick is only about 60% of expected body mass for its age. Clearly the physical beatings the chick has suffered, the presence of only one parent, and the inability of the female to feed her surviving offspring to satiation while defending him from intruders threaten his survival. It remains highly uncertain whether the chick will reach adulthood. I had expected that the dreadful treatment of the Flannery/Velvet chick by an intruding male would make me feel a gut-level hatred of the intruder. Indeed, I was horrified by the fiasco unfolding there. But knowing that the male wreaking this havoc is an old friend of ours — one that I watched as a chick on Townline Lake back in 2002, a young floater on Langley, Julia and Hanson lakes, and finally a failed breeder on Wisconsin River — has complicated my perspective. I am rooting strongly for the chick to survive the vicious onslaught, start to forage for itself, and fledge. 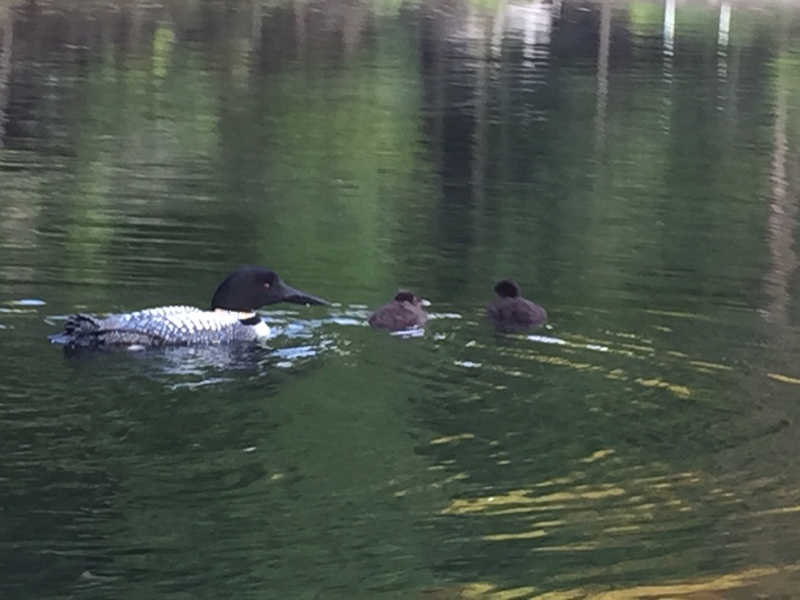 But I am also cheering a young male loon who is trying to turn his life around by moving into a new territory that offers the promise of abundant fatherhood.